"Two weeks ago I received a phone call from a very good friend and client of Clean and Green Solutions, Julia Beckman. Julia had just lifted up her son’s (EJ) booster chair in the back seat of her mini van and discovered a month old chocolate milk stain on the car upholstery. She called me and wanted to know if the EATOILS™ SUPER CARPET-FRESH™ would remove the stain. Julia has been buying the SUPER CARPET-FRESH™ for quite some time now to use in her home for carpeting and tile and grout stains, and also to clean up after those unfortunate and untimely pet accidents. I assured Julia that the EATOILS™ SUPER CARPET-FRESH™ would remove the stain and odor, even to the point where she would never know that it was there. This past weekend I sent her a message on Facebook asking her if I could use her name and write a little note about it. Here is her answer, copied and pasted directly from her reply:- "You may use my name!!! It was at least a month old chocolate milk underneath a car seat. I wiped up the crunchy stuff with a damp towel and then EATOILS™ SUPER CARPET-FRESH™ on the stain....it came right up! Sprayed a little while longer (to make sure it saturated underneath the fabric) and by the next day not one trace of the stain and no smell! Take an elaborate what you want!" As you can see she was quite happy with the results. EATOILS™ SUPER CARPET-FRESH™ is absolutely the best carpet, tile and grout, fabric, and upholstery cleaner and deodorizer on the market today. Plus it is GREENER-CHOICE™ APPROVED GREEN, which means it contains ZERO harmful chemicals or ingredients." Thanks Doug! We love those testimonials! Please keep them coming. Here's a graphic picture showing how an organic spill occurs - the liquid (wine, milk, coffee, tea, juice, chocolate milk, food, oil, etc.) 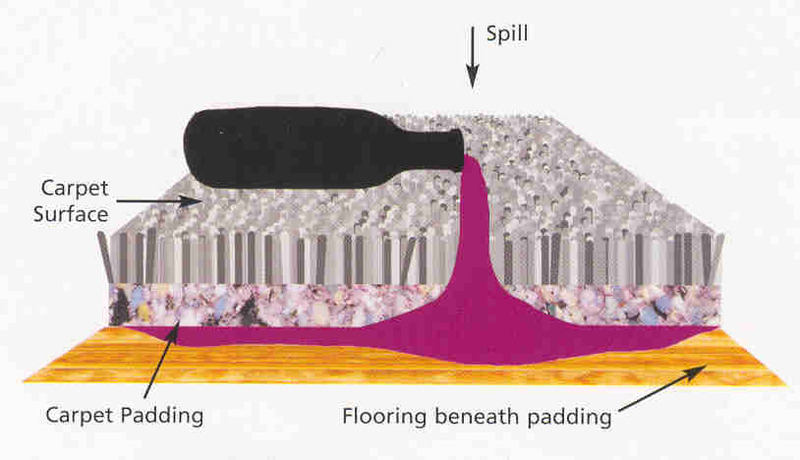 pours through the carpeting and/or fabric and through to whatever is behind - carpet padding, underlay, floor in the case of carpeting (padding, fill, batting, etc. in the case of upholstery). Surface stains can be small - an inch or two across - but below the visible surface they can actually spread up to ten times as wide behind the stain. Whatever method you use to clean the carpet/material you need to address the entire stain, otherwise you will discover that you will have a 'ring' of color that will re-appear around the cleaned area once it dries (this is the stain actually 'wicking' up the material at the perimeter of the cleaned area). So, for best results, you will need to clean an area much larger that the surface stain area. The cleaning product needs to penetrate the entire stain and it must effectively attack the stain and remove the source of the stain, preferably with a bio-enzymatic cleaning system that will use billions of tiny microbes - like tiny scrubbers - to continuously clean the stain until it is completely removed. Using a continuous cleaning formula like EATOILS™ SUPER CARPET-FRESH™ is an ideal way to ensure that the entire stain is removed both quickly and safely.